In my last blog posting I talked about the book, What I Learned from Jackie Robinson, written by the great Dodger pitcher Carl Erskine. If you have not read this posting I know you will be inspired by how he used what he learned from Jackie Robinson to raise his son Jimmy who was born with Down’s syndrome. This new blog posting will look at a second book written by Erskine titled, Tales from the Dodger Dugout. Carl Erskine pitched for the Brooklyn Dodgers and the L.A. Dodgers from 1948 until 1959. He was a pitching mainstay on Dodger teams that won 6 National League Pennants and the 1955 World Series. Some of his notable teammates included Pee Wee Reese, Jackie Robinson, Carl Furillo, Gil Hodges, Duke Snider, Roy Campanella, Clem Labine, Billy Cox, Joe Black, and Don Newcombe. Roger Khan immortalized the Dodgers of the 50s with his 1972 book, The Boys of Summer. The early 50s was a time in New York when there were three teams, the Yankees, NY Giants, and Brooklyn Dodgers. Each team had a great centerfielder, Mantle for the Yankees, Mays for the Giants and Snider for the Dodgers. The big question was: Who was the best centerfielder in NY? Of course, being a diehard Yankee fan, you know what my answer was. 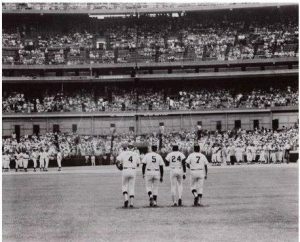 Below is pictured Snider, DiMaggio, Mays and Mantle walking in from centerfield on July 16,1977, at Shea Stadium on Old-Timers Day. I have chosen facts from Carl’s book that are related to my past blog postings. I wrote a blog posting about Dale Long, the left-handed power hitting first baseman for the Pirates in the 1950s. The reason for my blog about Dale Long was his grandson, also named Dale Long, was a student in one of my biostatistics classes at Quinnipiac University. 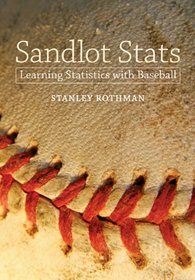 Dale Long was also featured in my book, Sandlot Stats: Learning Statistics with Baseball, because of his record setting 8 consecutive games with a home run. Later, this record was tied by Don Mattingly and Ken Griffey Jr. However, what I did not know was that it was Carl who gave up the 8th home run in game number 8. In writing a blog about the Dodgers and Giants moving to Los Angeles in 1957 I failed to mention that it was Carl who pitched and won the opening day game in front of 78,000 fans in LA on April 18, 1958, the first game for the Dodgers as the LA Dodgers. The Dodgers defeated the San Francisco Giants 6-5 and Carl pitched 8 innings giving up 4 earned runs. Still in another blog posting I wrote about, “The Shot Heard Around the World,” the Bobby Thomson 1951 playoff home run that gave the NY Giants the 1951 NL pennant. The Giants won playoff game 2. In the deciding 3rd playoff game with Bobby Thomson at the plate representing the winning run in the bottom of the ninth inning, Dodger manager Charlie Dressen called the bullpen coach where Ralph Branca and Carl Erskine were both warming up. The bullpen coach said they are both ready but Erskine is bouncing his curveball. Dressen chose to bring Branca in to face Thomson. On Branca’s second pitch Thomson delivered a three-run home run to win the game and the pennant for the Giants. Whenever Carl was asked what his best pitch was he said, “The curveball I bounced in the Polo Grounds bullpen.” In his book there is a picture of Carl with Bob Feller, Sandy Koufax, and Bob Gibson. These four pitchers totaled 10 no-hitters (Koufax 4, Feller 3, Carl 2, and Gibson 1). Carl writes, “The only distinction I can claim that the other three cannot—- I’m not in the Hall of Fame.” Carl’s 1956 no-hitter was the first nationally televised no-hitter. He also set the record for most strike outs 14 in a World Series game in 1953. This record was later broken by Koufax and then by Gibson at 17. Why ISN’T Carl Erskine in the HoF? It’s a disgrace!